Someone built walls, bombs, and various other death traps between the only paths that you can use to deliver food! You have to use precision, luck, and the power of ricochet, you have to fire a ball of food through the obstacles and reach the other side of each level. Unlock those OpenFeint achievements and compete in the leaderboards. This incredibly complicated way of delivering food is provided to us by Hadron Solutions on the iPhone, iPod touch, and iPad for $0.99. A doodle game! You know what that means? More people drawing on crinkled pieces of paper! Not sure what artist would draw on crinkled paper, but in the App world, crinkled paper allows your drawings to come to life! Awesome! 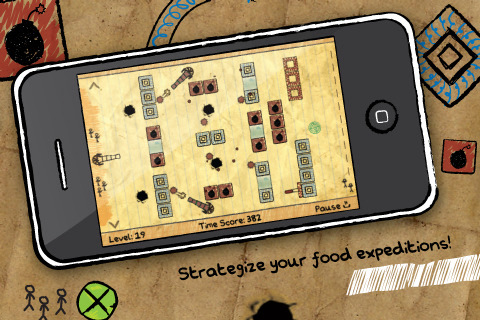 So Doodle Food Expedition is a game where you have to carefully bounce a ball of food through a maze of obstacles. Moving platforms, other cannons, holes in the paper, bomb tiles, and other crazy death traps trying to… starve your stick figures… I guess. The graphics are… average. The stick figures look fine, the paper effect, is once again, alright. No real need for it to be a bright yellow notepad and there doesn’t seem to be different paper backgrounds like graph paper or maybe construction paper. The obstacles are blocks and holes, so nothing special there. The big part of the game is the layouts of each level. Watching the ball make it all the way to the other side of the screen is more beautiful than a million stick figure drawings. The gameplay is really, really, addicting. The bouncing mechanic, though 100% unpredictable after the first two ricochets, works really well in making you repeat a stage dozens of times just to try and make the shot to the other side of the screen. The different obstacles are placed in such a way that there is pretty much only one way to make the shot and it’s a crazy challenge to figure it out on so many different stages. As levels progress, the puzzles range from teaching new tricks or learning about new obstacles, to being brutally hard to figure out without hours of trial and error. After failing to capture the full 3 stars from each level (my average was 1s and 2s), I was actually quite motivated to play the level over and over again. Imperfection is the ultimate motivation and this game has the right gameplay and level design to keep you coming back for more punishment. 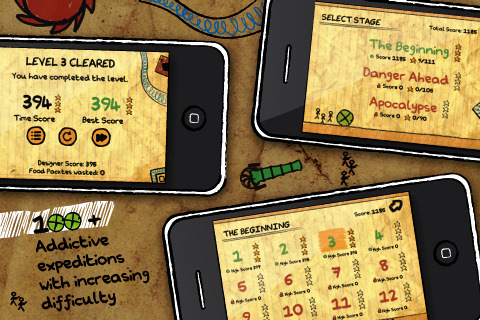 Doodle Food Expedition is a challenging, replayable game with nothing offensive about it. I personally can’t stand the Doodle art style unless it takes extra steps to improve on it rather than copying the same bland piece of paper, but this game was great fun to play and I think that’s more important in a game like this. With a bit more tweaking on the difficulty on some levels, I’d say this app is great. Check it out and start shooting your food out of cannons! DO IT. WHY AREN’T YOU DOING IT YET!???!? The crumpled paper demands it!! AppSafari review of Doodle Food Expedition was written by Joseph Ho on November 11th, 2010 and categorized under App Store, Games, Puzzler. Page viewed 5075 times, 1 so far today. Need help on using these apps? Please read the Help Page. Totally gonna get it. Just finished with the angry birds and cut the rope levels. Waiting for those updates, but until then will be wasting my time with this.